New logo, new achievements, new objectives: After the most successful season in the club’s history, Cimos Koper is aiming high at the Adriatic coast. First Koper won the Challenge Cup for the first time ever, then they became Slovenian champions and Slovenian cup winners. The triple champions are now participating in the VELUX EHF Champions League for the second time – and want to go further than in their debutant season when they were eliminated after the Group Phase. Therefore they signed four new players, including new goalkeeper Gorazd Skof (Zagreb), who will replace Darko Stanic who transferred to Skopje. The objectives of coach Freid Radojkovic and his team in the new season are clear: To defend all national titles and to reach the Last 16 in the VELUX EHF Champions League. Manager Ales Korsic: "We are very pleased that the VELUX EHF Champions League is back in Koper after four seasons. We have become more experienced, more aware of our qualities, and we do not have any fear of winning an important match anymore. We do not hope to finish our European season in February 2012, but instead to go on to the knock-out stage. Our home matches are our strongest assets, where we will have a very warm atmosphere and a lot of spectators." Team captain Uros Rapotec shares those high hopes: "Our goal is to play our best handball in every match. We compete in three different competitions and have matches almost every three days, which will not be an easy task for us. About our opponents we do not know too much yet, but there is still time to make an analysis of every one of them. We will always try to play our handball style. Every match will for sure be tough but we have gained enough experience in the previous season. So we believe in reaching the Last 16." ehfCL.com: What are your expectations for the upcoming season of the VELUX EHF Champions League – concerning your objectives and your group opponents? Fredi Radojkovic: Except for Hamburg, every other club in our group could be among the other three teams that will proceed to the next stage and continue competing in the VELUX EHF Champions League. In every match we will therefore see fights for every single ball, and every match will be very important. Our goal is to win all home matches and – apart from that – also some away games. I suppose that is the goal of every team in our group. Therefore I believe our group will be very interesting until the very last round. Fredi Radojkovic: This is the best that handball can offer. It will be a great experience for my players and me. Many of them have already played EHF Champions League matches, for few of them it will be a new experience. It’s a great opportunity for Cimos Koper to learn from better clubs, but also a chance to present our qualities. Handball is getting popular in the Koper region, therefore I strongly believe that there will be full house at our home matches and a fantastic atmosphere. Fredi Radojkovic: It is always hard to predict what will happen in May 2012. Quality in handball is very often connected with money. Therefore I expect there will be a majority of German and Spanish clubs at the VELUX EHF FINAL4. 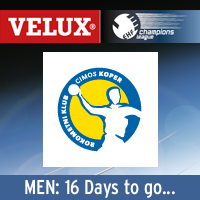 Find more information on RK Cimos Koper HERE.